This thick and hearty soup will warm you to the bone on a cold fall or winter's night. If you like, use green split peas or lentils and add some chopped cooked chicken during the last few minutes of cooking. The soup benefits from being made ahead. 1. In a 3- or 4-quart saucepan, combine the carrot, onion, celery, garlic, oil, and 1 tablespoon of water. Cook over low heat, stirring frequently, for about 10 minutes, or until softened but not browned. Add the curry powder and cook for 1 minute longer. 3. Add the green peas, bell pepper, black pepper, and salt to taste. Cook, uncovered, for about 5 minutes, or until the vegetables are softened. 4. Meanwhile, in a small bowl, combine the yogurt and dill. 5. 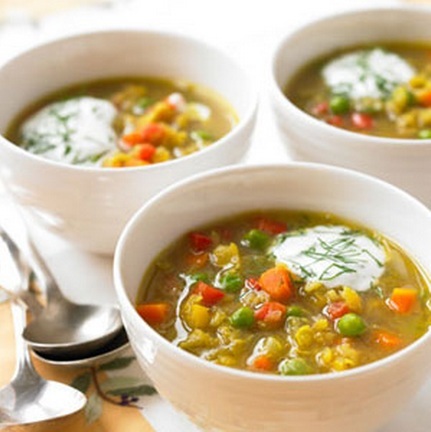 Ladle the soup into shallow bowls and top each with a dollop of the yogurt mixture. Nutritional Facts per serving: Calories 127.5cal; Fat 2.4g; Saturated Fat 0.5g; Cholesterol 2mg; Sodium 328.6mg; Carbohydrates 20.5g; Total Sugars 3.5g; Dietary Fiber 8.5g; Protein 6.6g. Brought to you by the Rodale Healthy Recipe Finder.